Welcome to "Surf's Up South" Welcome to what some call, "the real Florida". 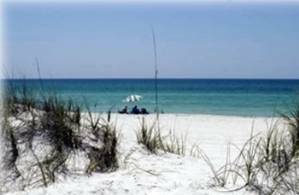 Experience a Florida Beach Vacation where sand, sea and sun are the main attractions. Guests, who want to get away from crowds and schedules will be happy at "Surf's Up South". The house is just across the street from "THE WORLD'S MOST BEAUTIFUL BEACH". A short stroll down a paved path leads directly to beach Access 88. This is second tier - Directly across a two lane street, no highway to cross, from the beach. Spacious and serene, "Surf's Up South" is a welcome retreat from the demands and stress of daily life. This is the perfect place for finding yourself, re-connecting with family and friends or simply breathing deeply once again. Mind, Body and Spirit are refreshed at "Surf's Up South". Spacious Living Room and the Beautiful Florida Room offer two great places for hanging out to watch movies, play games or simply relax in comfort as you share the great stories that families and close friends love to tell. 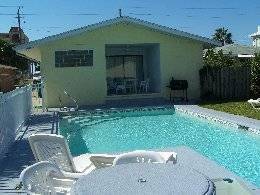 Enter this, spacious, 3 bedroom, 3 bath house with additional sleeping space, through the beautiful Florida Sun Room. This large and inviting Sun Room, similar to those featured in Coastal Living Magazine is a wonderful place to relax under azure skies in the cool tropical winds of early morning or evening. 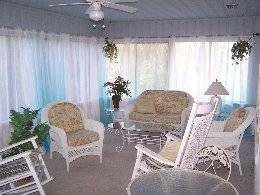 Willowy blue and white window treatment, ceiling fans, tropical white wicker furniture, surrounded by tropical foliage is directly across from the "World's Most Beautiful Beach". 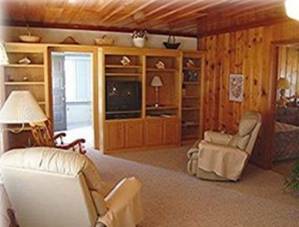 As you step into the living room, you are greeted by the warm, "real Florida" feeling that comes from the honey hued, native pine paneling, built in, custom cabinetry, large leather recliners, deep seat, queen size sleeper sofa and love seat. There is a new flat screen HD television in the living room. The house is equipped with broad band cable. The enormous size of the great room is quite impressive. Space is not stingy here. 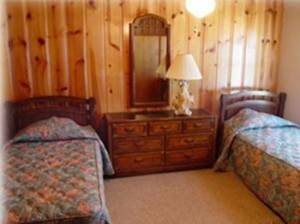 The well proportioned, comfortable rooms are large and inviting. The spacious livingroom, dining room and kitchen are accentuated by multiple windows. The front bedroom, furnished with a pair of matching twin beds is an ideal spot for children or adults. The second bedroom is furnished with a comfortable queen size bed. Both bedrooms have their own full bath. 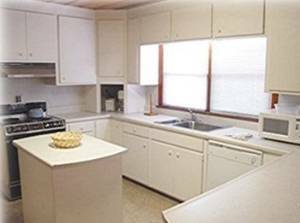 They have overhead and task lighting, ample storage space, windows, solid wood furniture and quality linens. To say the master suite is large is simply an understatement. The bedroom is simply huge! The walk-in closet is larger than many of the bedrooms in nearby condominiums. The king size bed, triple dresser, chest of drawers, television, bedside tables and two distinct seating areas with table and chairs complete this private space. The bedroom has been decorated in warm yet relaxing hues of brown, bronze and gold. The master suite includes a private spa size, bathroom. The relaxing jetted tub is enormous and a large, easily accessed step in shower stall. 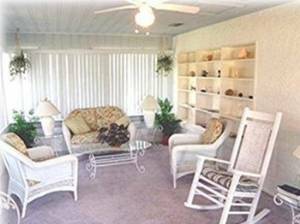 You can go directly from the the master suite to the covered porch beside the beautiful, large sundeck and pool. Don't worry, there are several other ways to access the pool. The dining room is also large. With an oversize oak dining table, sideboard, baker's rack, and a buffet table, formal dinners, family style or buffets can be easily and attractively prepared. Up to 12 people can dine in complete comfort. The kitchen, complete with center island, appliance barns, a pantry and more cabinets than you'd care to count is open and airy. Situated at the end of the large family room the chef and helpers can prepare meals without being isolated or left out of the fun. A full size washer and dryer is available in the laundry room which also doubles as another entry and exit to the pool and sundecks. Conveniently positioned, this allows guests to come straight in and drop suits, towels etc. right into the washer! "Surf's Up South" shares a large tropical lot, separated by a courtyard and pool, with twin 2 story townhouses. "Surf's Up East" and "Surf's Up West" These two bedroom, two bath town homes are also available for rental. They can be rented separately or as a pair, with or without, "Surf's Up South". Please contact us for information about availability. The combination is excellent for Family reunions, Beach Weddings, Family Parties and even company functions. Sorry- we do not rent to anyone under 21! During the cool seasons, guests may enjoy playing and relaxing in the warm, hollywood style pool heated, environmentally friendly, with a full size solar blanket. The inground pool in the courtyard, extremely large Florida Sun Room, Master suite and Master Bath are HUGE. The Master Suite has direct access to the pool, one step to enter this large single story house makes it easier for physically challenged adults or children. We are convenient to Frank Brown Park with tennis, aquatic center and ballfields, "Surf's Up South" is less than 2 miles from Camp Helen State Park and less than 5 from Pier Park. It is conveniently situated on the Bay Town Trolley line which also runs to Pier park several times daily. Access to Frank Brown Park and the new Panama City Airport is quick and easy from Surf's Up South. Beauty, Comfort, Convenience and Peace wait for you on "The World's Most Beautiful Beach". Come - celebrate Florida Style after all, Surf's up! We spent July 4 week at Surf's Up South. Had a great time. The house had many updates including furniture, obvioulsy new paint, beautiful master bedroom with a huge master bath that was spa like with decor and furnishings. We would have preferred to have wifi than just cable for laptop but other than that this was great. We were very happy and will be returning. Horrible experience with this property in June-2011. On family vacation with 11 people, 5 of which were children. Pool was terrible contaminated and problem was not corrected until end of vacation...so much for renting property with pool to enjoy. Three children got severe swimmers ear from conditions. Mother fell in leaky master shower and after 6 months of pain, meds, therapy and epidural, had to have back surgery. There was no bbq grill which was promised. Never again and would not recommend to anyone. Owner had no compassion for renters. We had a fantastic time at Surf's Up South. Just left there and do plan on returning. The entire experience was A+! Everything the management company said would happen, did exactly as they said. We were greeted in a friendly and efficient manner by the staff when we arrived. The house was spotlessly clean and more attractive than the pictures. The master bedroom is HUGE and the master bath is beautiful, looks just like a spa with the textured walls, beautiful arts, huge soaking jetted tub, separate shower. The Master bedroom did have an odor, obviously had just been painted prior to our arrival, just opened bedroom door to the patio for a little while and the paint was gone. The pool while not deep, think its only about 5' at best is large, it was sparkling clean and the area around the pool is really pretty with enormous foundation plants and trees. The house is across the street from the beach but access was very easy, we have a person in our family who has some challenge walking and she did the beach almost every day without much problem at all. We really had a great time and look forward to returning. Two families ( 10 in all) enjoyed this great rental May 27-June 2. We had a wonderful time and really appreciated the people that worked with us. They were very easy to work with even though we made their job a little more difficult, splitting everything in two, questions from two families, payments from two etc. but they never complained and everything was exactly as they said it would be. We did have a problem with the AC the third day we were there but they were very quick to come check it out, replaced the battery in the thermostat and had things back to normal fast. The house is large, two living areas perfect for us because the adults took one and the kids controlled the other or so they thought :) The beds were comfortable, there was enough room for everyone to sit together for meals, the beach access was smooth and easy to manage, the pool and the area around it was very pretty and perfectly maintained. The lawn and the pool were serviced during our stay without any problem or interruption. The ladies in our group took turns relaxing in the gigantic and so pretty master bath. The tub is so huge we could have used it for hot tub but ... Well anyway, we had a wonderful time and my half will be back, we've already made our reservation for next July 4th. Thank you PCFL Resorts! We will be back and we will tell others too. this house and we are grateful. We had a wonderful time. The house was clean, furnished with everything we needed, large enough for all 8 of us to relax without feeling as if we were in the way, we walked across the street to one of the prettiest sections of the beach I've ever seen. I've been coming to PCB for almost 20 years. The pool in back was pleasant and the yard itself was very private and quiet. We enjoyed sitting out in the Florida Room at night and the kids enjoyed playing their games on the televisions. 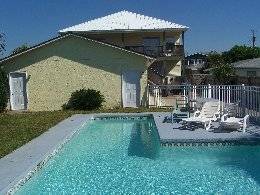 This was our second time with Panama City Florida Resorts and the first time at this house. We will be back. My family and I rented Surf's Up South for a week. There were 7 of us. We had plenty of room. The house was clean. The beds were comfortable. We had plenty of room. There was a nice pool in the back yard. It was shared with a townhouse but we only saw the person from the distance once. The house is across the street from the beach and it is very easy to get to the beach. There is a nice, flat sidewalk. great for hauling cooler, basket, kids toys,etc. We used the folding shopping buggy. The house is very comfortable. We had a fine time. We rented the house from Dr. George and his people at Panama City Fl Resorts. They were great to work with. Everything happened just like they said it would, they were courteous and professional. We did call one night because one of the smoke alarms kept going off and we didn't have a battery. They came out right away and was even nice then. We've stayed in several houses on the beach, this was by far one of our best experiences and we do plan to come again next year. This is a great place for a family vacation. My husband and I make frequent trips to Panama City Beach Florida and we were there the end of June of 2011. We learned that some very good friends of ours were there at the same time and made arrangements to go visit them for a short time. They were staying at Surf's Up South in Sunnyside. When we first arrived we both thought the house was pretty nice....very large and roomy....it wasn't fancy, but was perfect for their group of 11. Then we went out by the pool, off the master bedroom and I can tell you first hand that the private swimming pool that was on the property was in very bad condition. THere was alot of algae and mold on the sides of the pool and it just did not seem to be very clean at all. I personally did not get into the water as I did not bring my suit, but I wouldn't have anyway............it was that bad. I also observed tall weeds growing on one side of the pool and the lounging chairs were in very poor condition.....not broken, but the pads for them were very worn and torn and appeared to be very dirty. We left after a couple of hours but know from talking to our friends that they had made numerous calls to the owner about the condition of the pool and as of that time nothing had been done. I did find out that they did finally did get the situation rectified, but by the time that was done, their vacation was almost over. I’m not a fan of this property! We had a family vacation at the end of June 2011. My mother-in-law call owner about many issues with the property the number one to me was the pool. The pool tech finally came out and had to shock the pool because it was GREEN. Both my children got swimmers ear so bad we went to the ER 3times over the 4th of July weekend. July 11, my son still had swimmers ear he received more medication. My mother-in-law informed the owner many times regarding concerns during and after the vacation. Some kind of sorry or concern for my kids would have been nice from the owner but nothing I think its sad. Thank You Panama City Fl Resorts and owners for the best beach trip we've ever had. My husband's grandfather, my inlaws and my family of 5 stayed at Surf's Up South during the last week of July. We wanted a special place to be together before our oldest daughter starts college and before my husband's grandfather was unable to make long car trips. We got what we were hoping for. Everyone had a wonderful time. We had easy access ot the beach and the privacy of a home. airy, light and so nice to share during the evenings. the kids had access to the internet and their games and we all enjoyed the pool. The check in was easy, the staff was prepared and everything came off without a hitch. We did call once asking for help to find the entry to Lake Powell, the staff was very nice and helpful, We received our security deposit back in less time than they said it would be. There were vacationers in the townhouse while we were there, we didn't expect that but it was not a problem, we only saw them twice the entire week. We had a great time and we plan to return next year. I rented this property from Dr George from June 25-July 2, 2011. This was a vacation for my children, their spouses and our grandchildren. There were 11 of us. I rented the home because of location, size of home and because it had a private swimming pool. The house itself was fine; very spacious and fairly well maintained, although there were several problems that were brought to the owners attention, but were never addressed. The main problem, however, was the private swimming pool. It was very unsanitary, with mold and algae on the sides of the pool, a filter that was not working properly and a lack of chemicals in the water. It took three calls to the owner of the property to finally get someone out to correct the problems with the pool. By the time these problems were taken care of, we had only a day and a half left of vacation to enjoy the pool. As a result of the unsanitary conditions, three of my grandchildren got swimmers ear. Two of them had to go to the emergency room and one of them had to make a second trip to ER because of pain and draining of green stuff out of his ears. It took two rounds of antibiotic ear drops, numbing drops and a narcotic pain medication to cure his condition. And when I have tried to reason with Dr. George on this matter and get at least a partial refund, I was just ignored and called a "nutty lady". So if you do rent this property, I would definately check it out before turning over any money; I feel like I paid a large amount of money for a home that was not nearly worth that dollar amount; plus the money spent since our return on hospitals, doctors and prescriptions, due to negligence on the owners part. My family and I stayed at Surf's Up South for a week in July. We had a wonderful time. Panama City Beach has been one of our favorite vacation spots for several years, Now we also come for Little League baseball tournament games. We have stayed in condos and several of the houses on the beach. The access to the beach, really is right across the street was great. Panama City Fl Resorts did come out during our visit to bring some additional light bulbs, large ones in the kitchen blew out but they came as soon as we called. They were very courteous and friendly. When we checked in, they rememberd the team my boys are on (2 different ones) and had made a special written cheer for the team. BIG BIG surprise. We really had a great time. We have already made our reservation for Spring Break and will be renting Surf's Up South and one of the town houses when we come back next summer. those reservations have been made. Surf's Up South was wonderful. We had a great time in PCB and can't wait to go back. The house was clean, comfortable and so spacious. It has all of the comforts of home. It was a great place for our family, I can't imagine it being any better. It's close enough to the action and activities of PCB, but far enough away so the neighborhood is nice and quiet. The beach access is directly across the street, the beaches were beautiful and not crowded. The private pool is a huge bonus with this house. My daughters loved having the option of the beach or the pool. A big thanks to Dr. George and the rest! We'll be back! please add 175$ for end of stay cleaning and 12.5% sales tax. We do request a 250$ refundable loss/damage (security) deposit with every reservation.